These beautiful calla lilies, just “in bloom again,” were given to us by our friends Gina and John Fisher on the occasion of re-celebrating their wedding vows in our garden on their twentieth anniversary. The vase was obtained in Japan in the early ’70’s; the carved ivory piece is a treasure that has been in my wife’s family for generations and is also Japanese in origin. Click on In a Vase on Monday to visit the delightful postings of Cathy, the originator of this idea. 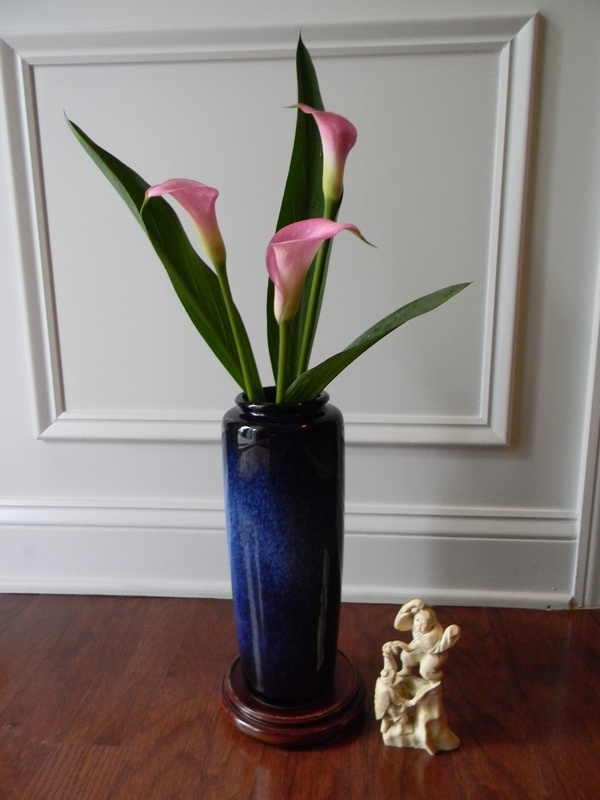 This entry was posted in Gardening, In a Vase on Monday and tagged --Katherine Hepburn, calla lilies, carved ivory, In a Vase on Monday, Japanese vase. Bookmark the permalink. Such an elegant flower it needs nothing else.